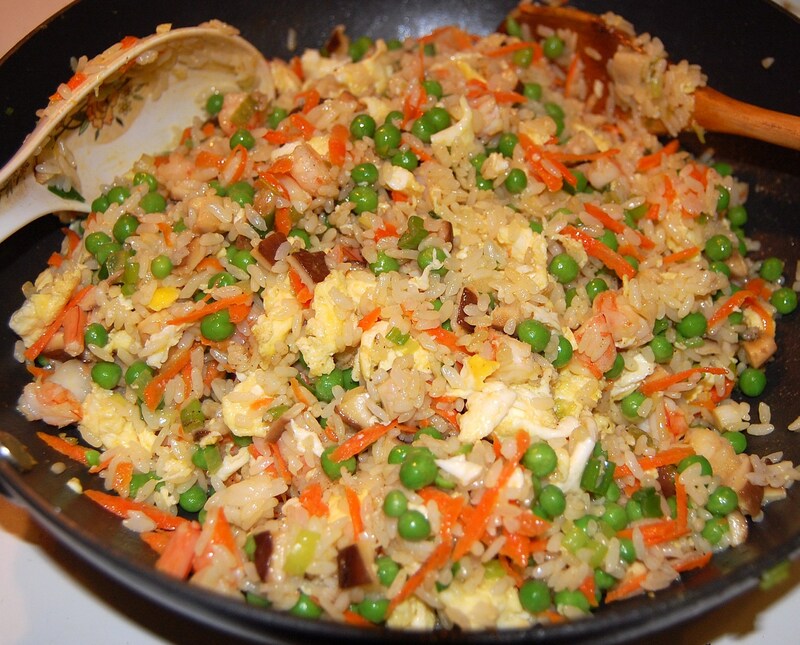 CarbSane has asked for a recipe for Yang Zhou Fried Rice; Yang Zhou is a city in southern China in a leading rice-farming region. As far as we know there is no special ingredient, though Wikipedia says that barbecued pork is a characteristic ingredient. The great thing about fried rice is that you can adjust the ingredients to your taste; use as many or as few as you like. So, here is our recipe — let’s call it Cambridge Fried Rice. 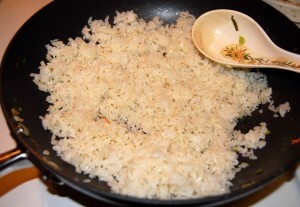 The key steps are to “fry” (really, warm and coat in oil) the ingredients separately, to get a good diffusion of oil throughout the rice and food. Here’s how it’s done. As always, click on images to enlarge. The long-grain rice should have been cooked, but long enough ago that it has had time to cool and dry. Traditionally, fried rice uses leftover rice — cooked earlier in the day or the previous day. We haven’t measured weights or counted calories, but it’s fairly obvious that this is a fat-rich (oils, egg yolks), carb-moderate (rice), protein-light (shrimp, egg whites) recipe with vegetables for good measure — essentially, the Perfect Health Diet macronutrient ratios. 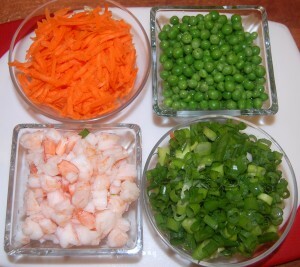 This is the basic recipe, add spices or ingredients to your taste! Aren’t peas legumes? I see this a lot, avoid legumes, but then recipes with them. We make an exception for peas. They’re the fruit of the pea plant and have low toxin levels. 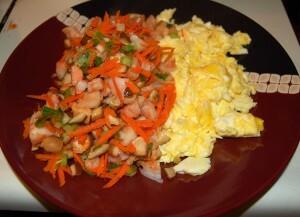 It’s all about avoiding toxins … As a rule legumes are high-toxicity foods, but there can be exceptions. What about field peas/spli peas? Thanks! I wish I could open up every jar in our Asian market to find the spice our favorite place uses to make their’s because there is something in there. If I ever figure out what, I’ll be sure to share. I’m going to try to make this at home and see how close it is otherwise. It’s so good I don’t even use soy sauce as I would do with regular fried rice or white rice. The restaurant version we like has chicken, pork, shrimp and eggs in it. Thanks so much for your book and blog – I’m learning a lot from both! 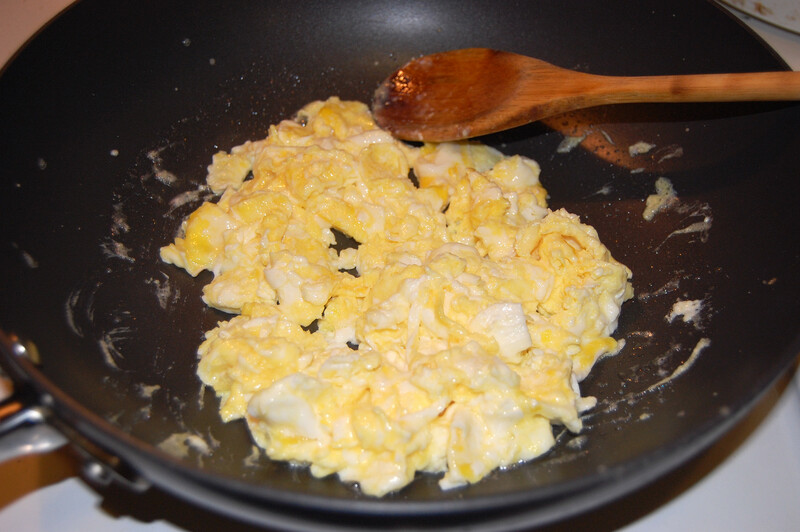 Most foods haven’t been thoroughly evaluated for toxins, so there’s some guesswork. But on a gross level, if you feed the beans (kidney beans, black beans, pinto beans, soybeans, you name it) raw to animals, they’ll get extremely sick or die. We list a bunch of examples in the book. Toxins include not only lectins but alpha amylase inhibitors, trypsin inhibitors, cyanogenic glycosides, and others. Cooking somewhat detoxifies them, but not entirely. Peanuts and peanut oil are also problematic. Some vetches cause irreversible paralysis from neurotoxins. On the other hand, I’ve never heard of anyone, human or animal, dying from peas. We eat peas a lot, including snow peas and sugar snap peas. Likewise green beans, although much less often than peas. So, yes, just like white rice is an exception to the “don’t eat grains” rule, peas are an exception to the “don’t eat legumes” rule. Hi Paul, why do you consider peas safer than green beans? I know green beans are the least problematic legume (classified as a vegetable not a legume). I also read that peas have high sucrose and fiber content and little starch. So maybe they can encourage fermentation in the gut. I didn’t mean green beans were less safe than peas, I meant that we eat them less often than peas. Because we like peas better. Sucrose and fiber are common to all vegetables. 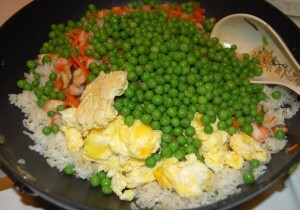 The fructose content of peas is similar to that of carrots, which we also eat. The fiber might be beneficial. It’s interesting that nutritiondata.com classifies young peas (the kind we eat) as vegetables, but mature pea seeds as legumes. The mature seeds have much higher calorie content and presumably much higher toxin content. Sorry for the confusion! Thanks for the links. erp read the first post. Thanks Paul, that’ll make a nice addition to our diet. Thanks, I haven’t had fried rice in a long time. I’m making this tonight. Mine will have eggs, bok choy, scallions, and flank steak. 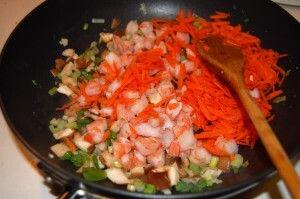 I’m seasoning it with ginger, lime, garlic and gluten-free Tamari. I can hardly wait!! 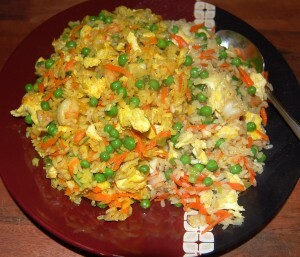 Homemade fried rice used to be one of my favourite meals but I haven’t made it since going low carb. I’m definitely putting it back on the menu. I always use bacon in mine, usually fried with some chopped onion. I’m glad to hear that peas are okay, my husband wants peas with everything! What is your opinion on his other favourite – broad (fava) beans? They have about one-quarter the calorie density of the more toxic legumes, and usually toxin content goes with calories, so they’re probably less toxic than most beans. Probably thorough cooking would make them OK in limited quantities. If we’re already at it, what’s about lentils? I like indian food from time to time and they make some damned tasty things with it. Lentils have pretty high toxin levels so I would avoid them. If you do eat them, they should be soaked overnight before cooking and then thoroughly cooked (~30 minutes in boiling/simmering water). Traditional Indian cooking takes a long time and is probably pretty good at detoxifying these things. But I don’t know about modern restaurants. Thanks Paul, in that case I better leave them. It’s not that big of a loss. Those have mainly sugars not starches … Yes, you should count their carb calories, especially if you’re eating a lot! Enjoy! 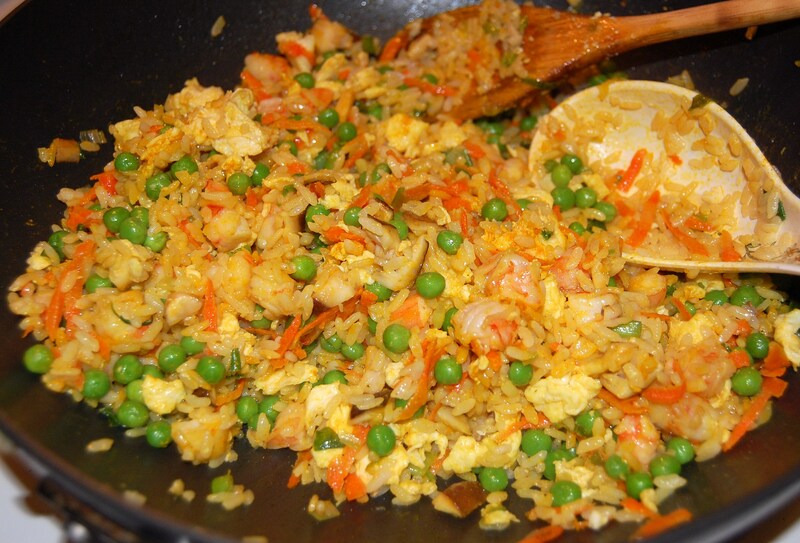 I made this fried rice earlier in the week with exactly the same ingredients and it was unbelievably good. I ate it for dinner, then breakfast and lunch the next day and I felt great the whole time. If you were willing to put together a pdf with 2 weeks of meal plans (with recipes), I’d be willing to pay good money for it. Shou-Ching is very excited about doing that and is working on it. She intends to have a book of recipes that can all be cooked in 30 minutes, taste great, and are Perfect Health Diet healthy. The current plan is to post 1 recipe a week and that will give us about 30 in six months. Then a few months to get it all publishable. I think that’s a pretty good schedule since we can only do this on weekends. We all LOVED this recipe, thank you so much Shou-Ching & Paul! The kids requested we add this recipe to our rotation. We used baby peas, shredded carrots, and lots of green onion. In addition to the eggs, we added shredded chicken from a batch of chicken stock cooking. We had GF Tamari on hand, and the tumeric was a nice touch. The only change we made was cooking our white rice (the day before) with coconut milk + water. We use 1 part rice to 1.5 parts liquid. That goes on the stove top and brought to a boil. I usually add some coconut oil and black pepper too. Once boiling, I transfer to a covered casserole dish and put it in a pre-heated oven at 350 for about 25 minutes, or until the liquid is absorbed. I’ve never had success cooking rice on the stove, and we don’t own a rice steamer, so it’s the oven & fail-proof rice for us. That’s a great idea, using coconut milk to cook the rice. Thanks! Hey, just found you via Chris Masterjohn’s blog. What a great recipe, I had to call an audible on dinner last night and pick up some shrimp and steamed rice from the store yesterday. The coconut oil really hits the spot. Welcome, Matt! It makes very convenient leftovers too. Thanks! Leftovers? I had half a gallon of leftovers, it’s been lunch for me and my wife for the past 2 days! Rice is so versatile! There are so many different varieties of “white rice”, though – do you recommend any over others? I’ve read some info that white basmati and jasmine rice are more nutritious and was wondering if it was better to eat them. Ayurvedic (India’s traditional medicine) doctors recommend white basmati rice over brown because it’s easier to digest and almost as nutritious. 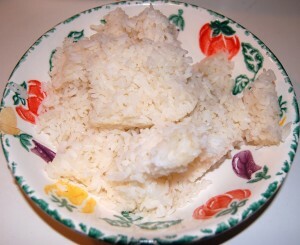 “White rice is considered easier to digest in Ayurveda. According to Ayurveda, Basmati rice is the king of all rices. Basmati rice is saatvic or pure, it balances all three doshas, it is nourishing for the body tissues and it is easy to digest. Aged Basmati rice has an aroma and flavor arguably the best in the world. Ayurveda recommends avoiding rice that is par boiled, instant or pre-cooked because is has less nutrition and less prana or life energy in it. 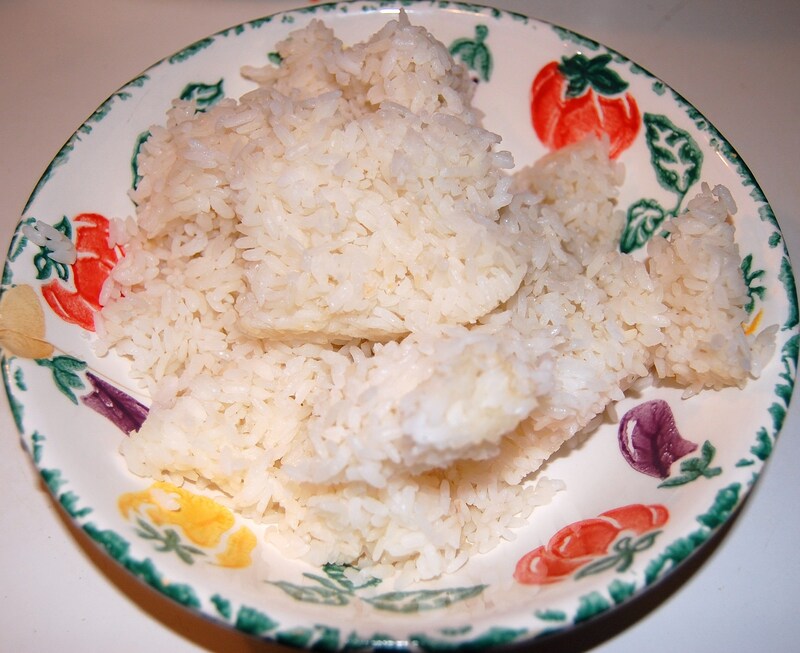 There are a lot of varieties of white rice, and some quality differences. One difference is time of harvest. They usually do multiple crops per year. Rice harvested early in the year (“first harvest” or “spring crop”) tends to have the most nutrition, later harvests become progressively lower in minerals. Another difference is stickiness. Long-grain varieties (popular in India and Vietnam) don’t stick together and are hard to eat with chopsticks or make sushi/desserts. Short-grain varieties (popular in Japan and China) stick together. Mochi or sticky rice is the most sticky. 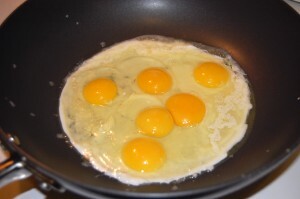 In terms of varieties, we don’t have health reasons to prefer one over another, and go by taste and texture ourselves. I think this is mainly a matter of taste. Like your Ayurvedic source, we also recommend white rice over brown, because it has fewer toxins and therefore is easier to digest. They differ mainly in protein content and protein is better obtained from animal, not plant, sources. How do they strip the brown rice bran to make it white? Is there chemicals involved like I have read to make white flour? The seeds of the rice plant are first milled using a rice huller to remove the chaff (the outer husks of the grain). At this point in the process, the product is called brown rice. The milling may be continued, removing the ‘bran’, i.e., the rest of the husk and the germ, thereby creating white rice. White rice, which keeps longer, lacks some important nutrients; in a limited diet which does not supplement the rice, brown rice helps to prevent the disease beriberi. I think it’s worth rinsing the rice before cooking to remove some of the surface coating, but I think in the US this is a starch or glucose coating which is benign. OK, I’m stupid. I searched wikipedia for white rice and only got “milling” and “polished” as an explanation. Then I got got “milling” from 5 more sites before posting my question. Sorry for wasting your time Paul. Thanks for helping us internet noobs. But we were on the topic and chemical deodorizing to turn brown to white flour comes up alot and white rice gets blamed by association. I got this “chemical deodorizing” question from my 6th grade niece about white rice being like white flour. I must have mentioned it to her a year ago. I’m so proud she remembered. She’s a smart one. Since we’re on the topic, I wanted to mention “Avoid the whites” is becoming a popular saying on the diet web world. This lumps white potatoes and white rice with white sugar and white flour. An unfortunate guilt by association strengthened by a cute phrase. 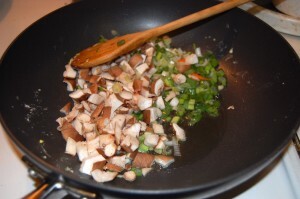 some version of Yang Zhou fried rice add liver. i dont’ think anyone in US is doing it tho. I have made a lot of stir-fry rice in my life, but until today, I had never separated the ingredients out while cooking as described. Plus, the tumeric was a great touch. I added a lot black pepper too. I see you cooked the veggies in olive oil. I thought it was better at lower temps or as a salad dressing due to the heat destroying its omega 3 and increasing its omega 6. 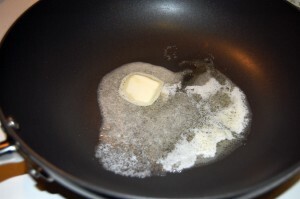 I have been cooking with coconut oil or butter. Is olive oil safe then to use for stir frying or high temp cooking/baking? Not sure how hot you were cooking but my understanding is stir fry means pretty hot. We do make minimal use of olive oil for cooking – coconut oil or milk, butter or ghee, and beef tallow are our go-to cooking fats – but this was a quick low-temperature operation aimed at simply coating and warming the vegetables and slightly cooking them. I doubt it damaged the olive oil much. A lot of chefs recommend high temperatures for stir frys but we don’t. I just made this for dinner and it was wonderful! There are a ton of leftovers and I plan to eat them for the next few days and then to freeze the rest for easy packable lunches. Thanks so much! As long as you’re speaking of legumes…I am wondering why non-canavanine containing legumes are not okay after being properly prepared by being soaked, rinsed, and slow-cooked. Thanks! They are OK, but we keep them on our don’t eat list because industrial versions aren’t prepared that way and we don’t expect most people would do it at home. I have two questions regarding legumes to which I’m curious whether you have any thoughts on. Would pressure cooking be the best cooking method for legumes? Also, personally I like lentils and chickpeas a lot (which I’m guessing both fit into the OK category), but I have very little experience with beans. Would you know off the top of your head of any bean varieties that are either particularly “safe” or, on the other hand, better avoided? Hi Jason, yes, pressure cooking is best, and I would say lentils are safest. Would you please clarify why pressure cooking would be better than a long soak of one or two days, followed by changing the water and rinsing well, then boiling hard for ten minutes and skimming off the foam, then cooking till done at the lowest possible simmer. Obviously it is simpler to pressure cook, but some chef types / cookbook authors who cook a lot of beans say that they prefer the slow cooking method when they have time. They especially like to do so in a clay pot. Their main concern is flavor. They never discuss the toxin issue. How does pressure cooking make them “safer”? Paul — above, you say lentils have “pretty high toxin levels” and 4 years later you say “lentils are safest”. And following up on Jason’s question, why is pressure cooking better than traditional methods? The uncooked levels are high but then they decrease with soaking and simmering in water. So with beans and lentils it mainly comes down to method of preparation. Can you recommend a rice steamer? We have a “Shop Kitchenware” page now. We recommend using the InstantPot pressure cooker to cook rice. Since you mention using soy sauce, it’s ok to use on food? Does the fermenting make it ok?